It’s been definitely a long wait: the vinyl pressing plants, their overbookings… All the usual stuff you may be familiar with, if you deal with music, records and you’re not a pretty big major label. Bot who cares. As good music is timeless. Isn’t it. And timelessness has always been a guide for our Nick Anthony Simoncino: his music defies gravity, defies the passing of ages, defies what’s past and what’s contemporaneity. There are some true values, in his music, that has always been the foundation od with we call underground club culture, and always will be. 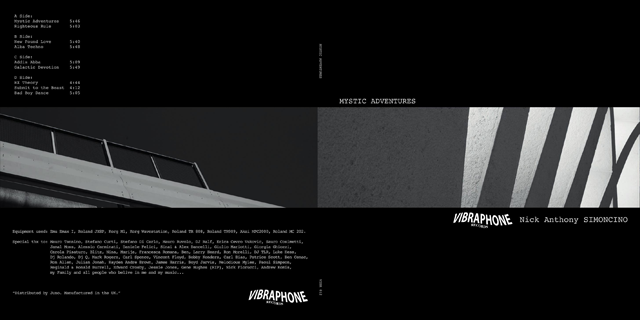 So, here we are: very proud to announce that “Mystic Adventures” is finally there. It’s out on the well revered Vibraphone Records, if you’re a true house music digger you know what that means. It’s a nine tracks affair. It’s a double vynil. It’s gold. It’s where our hero put so many efforts, time and thoughtfulness. And, if you ask as, he succeeded indeed. It’s exactly what we were dreaming to listen to. Give it a try it and, hopefully, grab it.